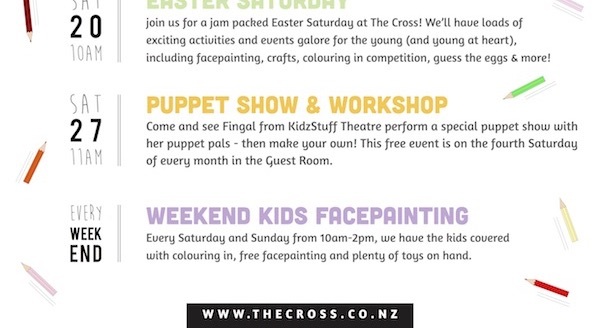 We've got some exciting things in store these School Holidays (13th - 28th April), check it out! 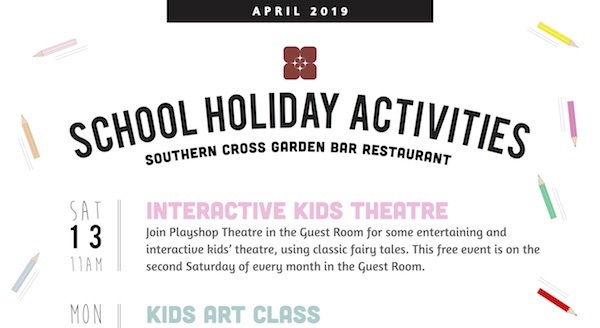 Join Playshop Theatre for some entertaining and interactive kids’ theatre, using classic fairy tales. This free event is on the second Saturday of every month in the Guest Room - check it out here. Enjoy a creative afternoon from 1pm - 3pm with local artist Dan Wilkinson. All ages welcome, bookings essential - $15 including all materials. To find out more, check out the event here. Register online now - just click here, fill out the details, and pay on the day. Ages 5-12 recommended for this class. Please Note: At least one parent or guardian must remain on premises for the duration of the class. Perfect opportunity to relax on a couch, have a coffee and a bit of 'me-time' while the kids get creative! 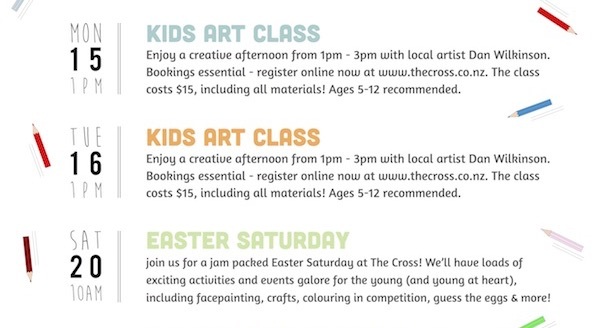 Join us for a jam packed Easter Saturday at The Cross! We’ll have loads of exciting activities and events galore for the young (and young at heart), including facepainting, crafts, colouring in competition, guess the eggs & more! Find out more here. Every Saturday and Sunday from 10am-2pm, our place is the perfect spot to bring your family and friends for a bite to eat. We have the kids covered, with colouring in, free facepainting and plenty of toys on hand.